The Public Record Office of Northern Ireland has launched a free online historical maps viewer for the six counties of present-day Northern Ireland: Antrim, Armagh, Down, Fermanagh, Londonderry and Tyrone. Belfast, now under a housing estate. 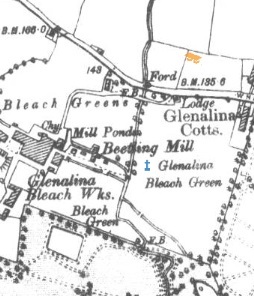 It allows you to search and browse seven historical Ordnance Survey maps and four contemporary basemaps (including aerial imagery), and displays county, parish and townland boundaries as well as information on sites, buildings and landmarks of historical interest. The functioning of the viewer and its ability to layer and compare the maps is pretty straightforward. I didn't encounter any difficulties with it when I had a trial run last night, but I'd recommend reading the clear instructions on the viewer home page linked above (or from the right-hand drop down menu) to get you up to speed without delay.